Unlike delicata or kohlrabi – delicious vegetables I discovered for the first time years ago via my farm share and gained the allure of exoticism from their novelty in modern mainstream American cooking – the first turnips I cooked seemed all too familiar. Granted, I couldn’t have recalled a time I actually ate them, but they had the air of subsistence eating, and in my mind a bit smelly (they are a member of the brassica genus and mustard family, after all). 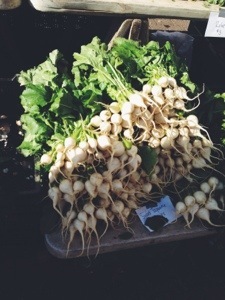 But then in the first few seasons of a new CSA, whose farmers were working out the kinks of quantities of various items grown, we received a lot of turnips in large bunches, their edible greens impressive. Dutifully, I roasted them or chopped them into soups with their greens. Sometimes I steamed or boiled and mashed them with other root vegetables like celeriac or rutabaga, doctoring them up with olive oil or butter and lots of seasonings. Some would have rotted from neglect were they not so hearty, so they all, eventually, were eaten. But as I expanded my turnip repertoire, I must say that I never fell in love with them. They often had that sulphur aftertaste that I could only take in small doses and not the satisfying creaminess of potatoes or the sweetness of carrots or parsnips. So when most recently I received a bunch of turnips in my CSA, and was looking for a new way to cook them, I hit upon an au gratin. I started by slicing the turnips thinly on a mandoline, along with onions and some parsnips I needed to use up as well. The recipe I was inspired by had butter browning in a deep skillet and the bottom layer of rounds browned into a crust, before subsequent layers of vegetables and seasonings were added and milk, infused with herbs and garlic poured on top and baked. Well yes, that was a tasty dish, but a bit much for a midweek dinner. I was impressed though that the turnips had lost their bite, and the addition of milk and just a bit of cheese made it feel decadent, even though it was still quite healthy. The next time I made it, I was cooking with friends and there was only a casserole dish large enough to hold the gratin. I just sliced the turnips with a large leek and a few extra potatoes, salted and seasoned every layer, and poured whole milk with a bit of mustard whisked in over the whole mess and topped with a bit of grated cheese. I baked it until bubbly and browned and it turned out just as good. I am so seriously happy to have received this post today. I just turnip greens this morning with an apple and a lemon to cut the taste. I have a fridge full and your au gratin is going to grace my table tonight. Thank you. I’m so happy! Wish I had discovered this recipes years ago, myself. Happy eating.